An enchanting day tour to the glorious West of Ireland where John Ford filmed "The Quiet Man". We arrive through Galway, also known as the City of the Tribes, see Kylemore Abbey and explore Connemara which means "inlets of the sea". Check-in for 07:35 departure from Dublin Heuston Station, opened in 1844 as the headquarters of the Great Southern & Western Railway and is now the official principal station of Iarnród Éireann, Ireland’s national railway company. As your train departs, we travel in a south westerly direction, through Dublin's western suburbs and then through the lush fertile countryside of Co. Kildare. Our journey takes us through the Curragh which is famous for its racecourse, home of the Irish Derby, and there are many stud farms in the vicinity. Your route takes you into the midlands and the Bog of Allen, vast tracts of peat-land. Before then we pass through the County Town of Tullamore and then to Clara across the gentle farmlands of north Offaly. The train crosses the Shannon, which marks an historic border between the province of Leinster and Connacht –the historic province of the West of Ireland. You are now heading due west, surrounded by peat bog on both sides of the line. On the last few kilometres before Galway, you will get your first glimpse of Galway Bay. Our tour today departs from right outside Galway Railway Station named in 1966 after one of the leaders of the 1916 Easter Rising – Eamon Ceannt. We go around Eyre Square ( John F Kennedy Park ) in the centre of Galway City before crossing the River Corrib on the Salmon Leap bridge, passing University College Galway, through the Galway suburbs and then striking out in a north westerly direction towards the savage beauty of Connemara. With glimpses of the mighty Lough Corrib ( Ireland’s second largest lake ) on our right hand side. We soon pass through the village of Moycullen and enter Ireland’s Gaeltacht, or Irish speaking area. We continue through the lovely village of Oughterard and start smelling the aroma of Ireland – the peat or turf fires and their unique blue smoke which has a wonderful fragrance! 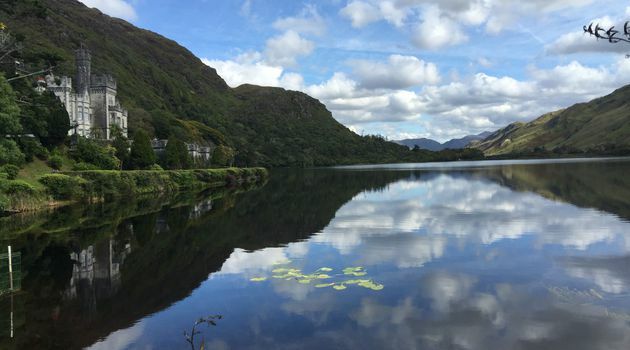 We now emerge into the spectacular scenery of Connemara – mountains, lakes - all there to behold! In the summer of 1951 the Irish American Hollywood film director John Ford ( his real name was John O’ Feeney ) fulfilled his lifetime ambition to film’ The Quiet Man’ using the wonderful backdrop of Connemara as his Mainstage. We now visit one of the locations – Leam Bridge, better known now as The Quiet Man bridge where Barry Fitzgerald and John Wayne stopped on their way from Castletown railway station to the mythical Innisfree! From here on our journey today you will start to notice the remains of the much missed Galway to Clifden railway line which ran parallel to our route – this spectacular branch line was closed in 1935! We then proceed towards the hamlet of Maam and make our way down the Maam Valley between the majestic Twelve Bens and Maamturk mountains! This area is known as Joyce Country and is where anyone in the world called Joyce – has their roots! We pause next at the pretty little village of Leenane, magnificently situated at the head of Killary Harbour – Ireland’s only true fjord, nine miles from the ocean. We continue on through fabulous scenery to stunning Kylemore Abbey, built by Mitchell Henry as a home for his Bride in the mid nineteenth century. It is now a Benedictine Convent and is open to visitors. We stop here for almost two hours with time for lunch ( not included ) and exploring – including the beautiful Victorian Walled Garden, and the Gothic Church. We continue through the Kylemore Pass and the village of Letterfrack and start skirting Bays and inlets of the sea/ocean which adds to Connemara’s attractiveness! Soon we are back on the Wild Atlantic Way and making our way around Streamstown Bay before climbing steeply up the really spectacular Sky Road, where we will have a truly satisfying photo stop with phenomenal views of the wild Atlantic Ocean! We then descend into Connemara’s Capital, the lovely town of Clifden, for a comfort stop where there will be time for some shopping – or even a pint! We leave Clifden and start making our way back to Galway through more breathtaking scenery – with a comfort stop at Maam Cross – if required. We arrive back in Galway, the City of the Tribes – by 1830 (6.30pm). Arrive in Galway and our conducted tour of Connemara leaves Galway to the village of Moycullen. From Moycullen the road rises and falls towards the lovely village of Oughterard on the shores of Lough Corrib, traditionally regarded as Ireland’s premier angling centre. Now the gateway to Connemara opens and the breathtaking colours of this unspoilt countryside are revealed in all their natural splendour. At Maam Cross, the Connemara "crossroads", there is a replica of the cottage used in the 1950s John Wayne and Maureen O'Hara film "The Quiet Man", which was filmed here.From Maam Cross our tour heads out to Leenane, Kylemore Abbey and Letterfrack, in the shadow of purple mountains rolling down to blue and green rocky valleys, reflecting the rich and varied colours of Connemara. There is a lunch break at Kylemore Abbey and Gardens, an 18th century castle now owned by the Benedictine nuns who run an excellent pottery, gift shop and restaurant here. Letterfrack is one of Ireland’s major national parks. The colourful town of Clifden has been one of Ireland's leading holiday resorts for generations. It is an excellent touring centre beloved by the walker, the biker, the hiker or the fisherman. It was here too, at Derrygimlagh Bog near Clifden, that aviation history was made when Alcock and Brown crash landed after their historic transatlantic flight in 1919. Our tour of Connemara heads homewards towards Galway City now, along the shores of Galway bay, through the Gaeltacht villages of Inverin and Spiddal and looking out across the blue waters of the Atlantic at the unique limestone of the Burren and the hills of Clare. After your day's touring you will be returned to Galway Station to return to Dublin. We leave Clifden and start making our way back to Galway through more breathtaking scenery – with a comfort stop at Maam Cross if required. We arrive back in Galway, the City of the Tribes – by 1830 (6.30pm). Departure: Customer Service Desk at Heuston Station where our Check-In representative will be in their yellow jacket!